Striker Kevin van Veen felt Lincoln City ‘got lucky’ in their 3-2 FA Cup first round win over the Cobblers on Saturday. Town had done brilliantly to battle back from 2-0 down to level it up at 2-2 going into the closing stages at Sincil Bank, with van Veen netting the equaliser on 81 minutes after Jack Bridge had reduced the arrears. Keith Curle’s men thought they had done enough against the Sky Bet League Two leaders to earn a replay at the PTS Academy Stadium. But it wasn’t to be as Town were hit with a sucker-punch in the second minute of time added on. Winger Bruno Andrade was the goal star for the Imps, with his long-range curling effort beating David Cornell to win it for the home side. The ball took a crucial deflection off defender Hakeem Odoffin that helped it on its way into the net via the upright, and van Veen said: “When we did make it 2-2, it was very frustrating that they had a fluke. “It was a lucky shot that got deflected and at that moment it looked like we were the team that was going to win the game. 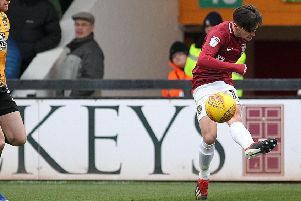 Van Veen was restored to the Cobblers’ starting line-up on Saturday, having sat out the Checkatrade Trophy win over Fulham Under-21s last Tuesday. The former Scunthorpe United man admitted that he wanted to play in that game, just as he does every other match, but that he understands manager Curle’s current philosophy of chopping and changing his attacking players. “I wanted to start (against Fulham 21s) but me and the gaffer speak a lot with each other,” said van Veen, who has now scored seven goals this season. “He kept me out of the team for Macclesfield as well to get me really fresh for the Oldham game. “And to be fair, that paid off because I got an assist and scored the penalty. “Last Tuesday, everybody needs to play and everybody needs minutes and I can’t play every game. The Cobblers and van Veen have a free midweek this week, before returning to league two action on Saturday with a trip to Exeter City.